All pre-conference sessions Thursday and Friday and guest tickets are an additional cost. Veronika Scott has been named a 2015 Forbes 30 Under 30 Social Entrepreneur, “CNN Hero”, and the youngest recipient of the JFK New Frontier Award, just to name a few of her accolades. She created the Empowerment Plan - a Detroit based nonprofit organization focused on permanently elevating families from the generational cycle of homelessness. Single parents are hired from local shelters and provided with training and full-time employment as seamstresses so that they can earn a stable income, find secure housing, and regain their independence. The Empowerment Plan story has been told across the world. Dr. Murray, a renowned professor of pediatrics at Ohio State University, has focused on school-based nutrition policy emphasizing the importance of diet quality during early childhood throughout his career. He will provide encouragement and inspiration to keep up the efforts to ensure all children have access to a nutritious breakfast. You’ll leave with solid evidence to present to stakeholders on the importance of breakfast in your district and why breakfast really is the most important meal of the day! Do you lead others or want to lead others in the future? This academy is a comprehensive leadership development experience to prepare individuals to effectively lead operations in their districts. In addition to growing leadership skills, you’ll also gain better understanding of topics such as financial accountability, nutrition, customer service, dealing with conflict and difficult employees, and much more. It is designed to improve the technical skills, but also help individuals grasp leadership concepts and prepare for making the leap from co-worker to leader! Learn essential nutrition facts and understand the dietary guidelines for Americans. Required for SNA certification. Discover shortcuts that will help you balance your busy schedule and market your program. You’ll learn time-saving social media shortcuts to promote your meal program to parents, students, and key stakeholders. You’ll also learn how to create professional images with a free & easy-to-use graphic design tool. You will get hands on experience with a variety of platforms. Bring your electronic device so you can leave ready to post! The SNS Credential is a mark of excellence and achievement that reflects what it takes to manage school nutrition programs in today’s challenging climate. The SNS Credentialing Exam evaluates candidates’ knowledge and skills required to perform specific job activities related to managing or directing school nutrition programs. Presenter(s): David Hulings, Hulings and Associates, L.L.C. Learn how to match your leadership style with the culture of the organization. Matching leadership style to the cultural landscape will allow you to increase your productivity, decrease communication problems and strengthen your conflict management skills. Understand the laws and regulations that require accommodations for feeding children with special food and nutrition requirements. Is your breakfast participation experiencing a batting slump? Come join us for an interactive workshop about increasing breakfast participation. Add new recipes to your breakfast roster. Sample new products. Learn more about expanding breakfast and how to add new resources to your breakfast team. Empowerment is a strong tool in today's world. If you believe in what you're doing, you become self determined. Hear how a young eentrepreneur created a nonprofit organization on the premise of empowerment and is tackling homelessness in Detroit. Students are better with breakfast. Even though low breakfast participation is common, but it doesn’t need to be. Hear about how many schools are pumping up participation. The 10 Cents A Meal for School Kids & Farms pilot program is helping to connect kids to a wider variety of produce, to farms and farmers. Join us to learn more about this grant, it’s benefits to your program and how to become part of it. A04 – Block Grants: Putting School Meals on the Chopping Block! Get a brief update from SNA on where we are with Child Nutrition Reauthorization (CNR). You will leave with a better understanding of where we are in the process; what block grants are and if implemented just how detrimental they would be to our programs. Marketing is a key aspect to making meal programs successful. Learn how to market and brand your programs effectively to increase participation while educating staff and parents on why school meals are better than ever. Leave with strategies to showcase your existing and new items. We know as Foodservice Professionals many students receive their most nutritious meal of the day at school - in some cases, their only meals. How can we relay this message to our school boards and administrators? Get tools to help you communicate the importance of school nutrition and how your district can benefit from a successful program. Do your menus need a makeover? Find ways to provide delicious options for your fussiest eaters. Leave this session with innovative ideas to create new and exciting menus your students will enjoy. Learn about mindfulness and how it can benefit you at work and home. Pinpoint behaviors which can make you vulnerable or resilient to stress. Experience mindful movements as a way to relax. B03 – Feeding the Dream: What Exactly is that Dream? It should be our dream that all kids are provided a nutritious meal through our programs. Join a discussion on how to jump start your school meals program while finding team members that can help you realize that dream nutrition program. Discover how you can establish meaningful benchmarks that help monitor meal participation, expenses, and revenues. Having the right data to analyze can go a long way toward a successful program. For the first time in history, four generations are working together in the workplace. In this session, you will learn about these different generations, including values that drive each group, as we explore ways to work effectively together. Hear best practices for helping administrators understand the importance of school nutrition. You’ll leave ready to show your administration how school meals fuel learning, the professionalism of the school nutrition team, and the importance of belonging to SNAM/SNA. It takes a team to feed our students and create a successful school nutrition program. Hear from wellness champions on how to increase staff morale and improve your team's health and productivity! Learn the important benefits of standardized recipes that can positively impact your program. Save your program money, make sure nutritional integrity is consistent and improve customer satisfaction. Do you hear about legislation and don't understand how it relates to you and your position? Get a quick overview of the implications federal legislation has on our food service programs and how your voice really does matter. Some level of whole grains appear to be with us from now on. Hear an overview of whole grain and its importance in school meals. Learn useful strategies on getting kids to like whole grain products. Want to try something new in your district? Or do you have an idea to share with others? Come to this interactive session to hear about innovative and fun ideas from across the state that you can steal for your district. Chef collaboration in school food programs has become a vital component for success. Improve taste, nutrition, consumption and palatability in your school district by working with a chef. Sure, every district that participates in the National School Lunch or Breakfast Program is required to have a Local Wellness Policy. But how do we do more than the bare minimum? How do we get people involved? How do we avoid findings in our Administrative Review? Tackle these questions and more, and learn about resources to help build a strong local wellness policy. How can you change how your colleagues view you in the workplace? How you dress, behave and present your personal image can impact how others view and treat you. Learn small changes that you can make to ramp up your image and present your best self. Hear about how Waterford Schools has implemented an extensive school garden program. Explore all the benefits such a plan can bring to your foodservice program and how to get the school community engaged. Learn about the endless possibilities and how you can successfully start your own. One way to increase employee engagement is to create a culture of appreciation. Hear how one FSD has prepared her assistant for his future in school foodservice. Learn how to foster talent, be a great mentor, bring out the best in others and create a culture of recognition and appreciation. D06 - Work Life Balance – Take Care of Yourself! Work-life balance is a struggle for all of us, even as our work continues to be more demanding. Get encouraged to make time for yourself and learn strategies to help you stay clearheaded and healthy on a daily basis. All full conference attendees will earn 6 CEUs. Pre-conference sessions may qualify as additional CEUs. 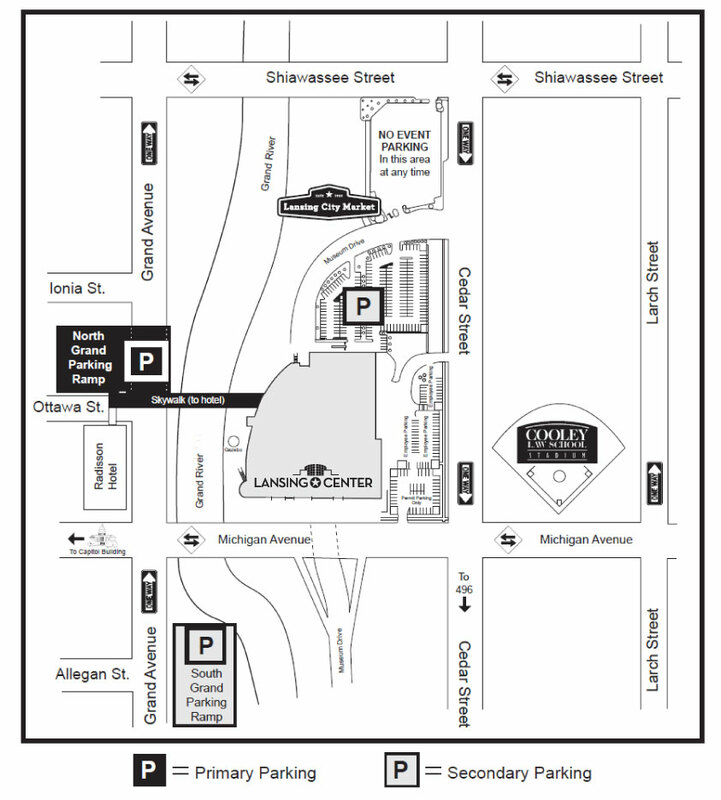 Parking lots are located under the Lansing Center and north of the Radisson Hotel for a flat daily rate, view map here. Cash and credit cards are accepted. Reservations must be made by September 24, 2018 to guarantee the group rate. Call 800.333.3333 and mention the School Nutrition Association of Michigan conference or make a reservation online here with promo code SNAM18.